Would love your expert advice on my fiddle leaf fig. It is not doing well and appears to be dying. 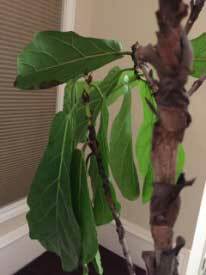 This is a ficus lyrata tree that I’ve owned for 18 months. It is potted in a 14 in plastic pot, the original one the tree came in from the garden center. The tree did well and thrived for the first 14 months. 4 months ago we moved and that’s when trouble started. When we moved in, there were very few options for where to put the plant. I placed the plant in our bedroom, which has a NE facing window. We have no good natural sunlight in the house due to our placement between other houses. 1 month after moving in, the plant began dropping leaves. I realized it was near an overhead air conditioner vent which is likely the cause of why it dropped dozen of leaves. So I moved the tree next to a NE facing window. It began to show lots of new growth at the top of the plant and I was excited it was recovering. Unfortunately, shorty after the new growth matured, these new leaves stayed very pale green, and are now drooping completely flat, their stalks flaccid. Some of these new leaves at the top have brown spots. As far as watering, I water the plant sparingly, every 2 – 3 weeks when the top is dried out. However, when I took the plant out of its pot and off the water catching plate, the bottom is soaked. My guess is it is not draining. Today I placed the tree next to our SE facing window to catch a little more light and some of the leaves perked up. What do you think is the main source of why its struggling and can we save it? 1. Is it over-watered or under-watered? Should I give it water with a shower soak once and let it drain as so many online sources have said? Or is this misguided information? 2. Should I fertilize the tree or is that bad for a tree in distress? 3. Should I repot and place stones for drainage? I don’t know how to tell if the roots are overgrowing or if it needs to be repotted. 4. Lastly, I noticed gnats flying out of the soil today. What is the problem there and how should I go about fixing it? Thank you so much for your help! This plants was a gift from my mother and it would mean the world to me if we can save it. Any bit of advice you can provide would be wonderful! Thank you for the detailed information and the photos. Your Fiddle-leafed Fig is pretty far gone and it may be too late to turn it around. I see there are already several completely bare stems. The primary problem has been lack of adequate light, at least until just recently. This plant must be located right in front of and close to a sunny window. Without adequate light, nothing else matters very much. The AC vent is not likely to have affected the plant. 1. When kept in its original nursery pot and given adequate light, then a thorough watering once per week is just about right for this plant. Water until a bit of water trickles through the drain holes. Excess water should evaporate within 12 hours. It should not be left sitting in water for longer than that. It should NOT take 2-3 weeks for the soil to dry out properly unless it is not getting proper light. There is no advantage to watering it in the shower unless you enjoy schlepping your tree! You can get just as much water into they root zone by using a water can. 2. Fertilizer is intended for healthy plants that are growing vigorously. It is NOT medicine for ailing plants, although the fertilizer manufacturers would like you to believe it is. 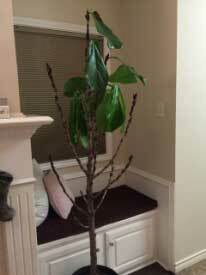 3.Your Ficus does not need repotting and it never will, despite what you read online. Putting “drainage material” in the bottom of pots is an out-of-date and discredited practice. 4. Fungus gnats are an indication of rotting roots caused by not allowing the soil to dry out properly. Keeping the upper level of the soil very dry will deprive the gnat larvae of the moisture they require and it will also help prevent further root rot. Bottom line: more light and less water and lots of patience for what will be a very slow recovery at best. Good luck!